When it comes to purchasing DC power products, there are a few things you want from the equipment you buy. You want reliability, affordability, and longevity in your products. You rely on your battery equipment and other power products to operate smoothly in order for your company to run without issues. 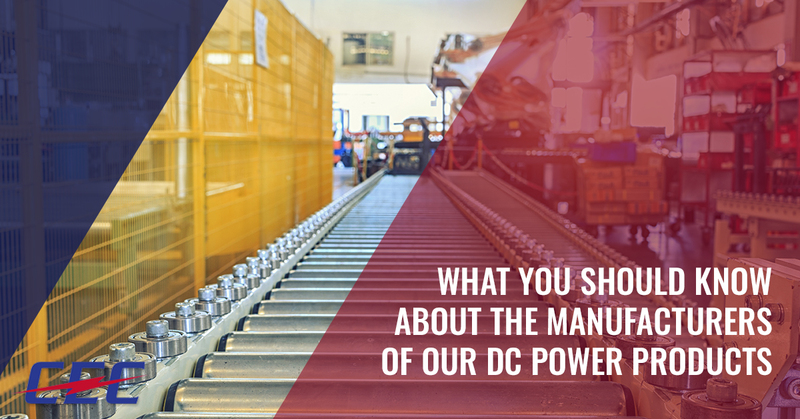 Here at Conley Equipment Company, we value the same things in DC power products, which is why we have partnered with industry leaders for the manufacturing of all DC products we offer. Whether you are coming to us for a small battery power supply solution or you are looking for a major power equipment setup, we are here to offer you the finest in DC power products. Read on to learn more about what you need to know about the manufacturers we work with and reach out to our team at any time to work with a consultant to find the power equipment you need. When it came to choosing the manufacturers we wanted to work with, the decision was not taken lightly. There are countless options on the market for DC power products. If you have been shopping for new DC power equipment, then you probably have run into the overwhelming flood of choices available. One of the benefits of working with our team at Conley Equipment Company is that we have taken the time necessary to properly vet the manufacturers chosen. With our own reputation on the line, we wanted to be sure we were picking only the very best in the industry. Not only did we want manufacturers who we could count on for quality products, we also wanted to work with companies that would pass on affordability to our clients. After much deliberation, we chose the following two DC power product manufacturers as our suppliers. When it comes to high-efficiency power electronics and energy conversion, Eltek is a true industry leader. Working on the global market, Eltek has clients in over 100 countries and spans numerous industries. One of the reasons we chose to partner with this company is due to their long-established presence in the market. They have over 40 years of experience in the industry and they endeavor to help clients save energy and money. They are also industry leaders in helping to reduce the environmental impact of power solutions globally. ABB is a GE Heritage business with their foundation beginning with Thomas Edison himself. Presently, they strive to transform the future of electrification. Areas where they are making strides include the implementation of smart technology in safely controlling electricity, as well as crafting rugged solutions that can hold up under harsh conditions. With GE’s resources backing their growth, ABB works to constantly design and reimagine how DC power products can better serve us in the future. Are you interested in investing in new DC power products? We invite you to reach out to our team to learn more about how we can help you with the engineering of your power system, the purchasing of the ideal products for your needs, and the final installation of these products. We look forward to sharing the outstanding solutions offered by our trusted manufacturing partners.